Track cycling has been around since at least 1870. When cycling was in its infancy, wooden indoor tracks were laid which resemble those of modern velodromes. These velodromes consisted of two straights and slightly banked turns. 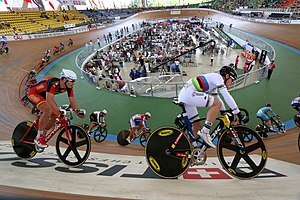 With the exception of the 1912 Olympics, track cycling has been featured in every modern Olympic Games. Women's track cycling was first included in the modern Olympics in 1988. The sport was moved indoors since 2000 Summer Olympics in Sydney. Along the decades, track lengths have been gradually reduced. Early velodromes varied in length between 130 and 500 metres long. By the 1960s, a standard length of 333.33 metres length were commonly used for international competitions. Since 1990, international velodromes usually have a length of 250 metres. Track cycling is particularly popular in Europe, notably Belgium, France, Germany and the United Kingdom where it is often used as off-season training by road racers (professional six-day events were often entered by two-man teams comprising a leading road racer and a track specialist). The sport also has significant followings in Japan and Australia. Endurance races are held over much longer distances. While these primarily test the riders endurance abilities, the ability to sprint effectively is also required in the Madison, points race and scratch race. The length of these races varies from 12–16 laps for the individual and team pursuit races, up to 120 laps for a full length Madison race in World Championships or Olympic Games. or "Devil Take the Hindmost"
The UCI Track Cycling World Championships are held every year, usually in March or April at the end of the winter track season. There are currently 20 events in the World Championships, 10 for men and 10 for women. Qualification places are determined by different countries performance during the World Cup Classic series held through the season. Aerodynamic drag is a significant factor in both road and track racing. Frames are often constructed of moulded carbon fiber, for a lightweight design. More recently, track (and road) bikes have employed airfoil designs on the tubes of the frame to reduce aerodynamic drag. On a dedicated track bicycle there are few components, with no need for brakes or derailleurs (and therefore shifters). In fact the only moving part on a bicycle is the drivetrain, which includes the cranks, pedals, the single chainring, one cog fixed to the hub without a freewheel mechanism and the chain itself. Because of this the need for aerodynamic components is minimised, and the aerodynamics to weight ratio makes aerodynamic componentry, at present, an idea with more cons than pros. In addition to regular track racing, tracks are also the venue for many speed records. These are over either a fixed distance or for a fixed period of time. The most famous of these is the hour record, which involves simply riding as far as possible in one hour. The history of the hour record is replete with exploits by some of the greatest names in cycling from both road and track racing (including, among others, Major Taylor, Henri Desgrange, Fausto Coppi, Jacques Anquetil, Eddy Merckx, Francesco Moser, Miguel Indurain and Tony Rominger). Originally, attempts were made at velodromes with reputations for being fast (such as the Velodromo Vigorelli in Milan). More recently, attempts have moved to high-altitude locations, such as Mexico City, where the thinner air results in lower aerodynamic drag, which more than offsets the added difficulty of breathing. Innovations in equipment and the rider's position on the bike have also led to dramatic improvements in the hour record, but have also been a source of controversy (see Graeme Obree). ^ "Cycling Track Equipment and History - Olympic Sport History". International Olympic Committee. 2018-05-15. Retrieved 2019-01-19.